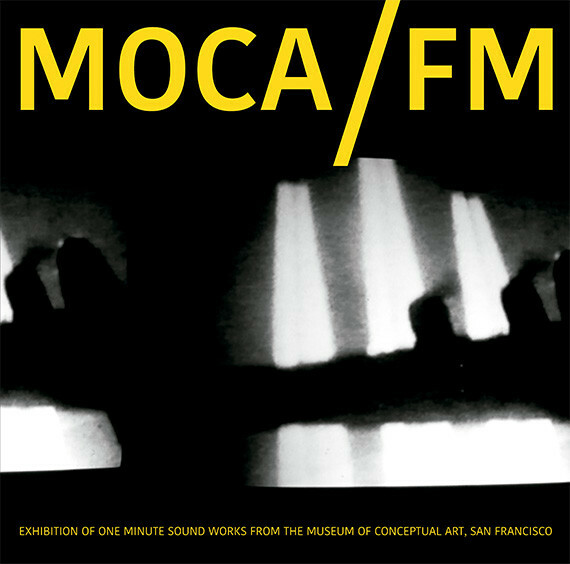 Slowscan’s MOCA/FM release is an anthology of audio art pieces by 26 performance artists from the late 1960s-early 1970s that was broadcast on KPFA-FM radio, Berkeley in 1971. The radio broadcast consisted of one-minute works presented by the Museum of Conceptual Art (MOCA), San Francisco, which was initiated and realised as a ‘non profit corporation with paying memberships and a permanent collection’ by Tom Marioni in 1970. Marioni’s MOCA existed until 1984 and was a specialized museum for sculpture, performance and site-specific works. Shows included ‘Sound Sculpture As’, ‘Body Works’ and ‘Terry Fox’ in 1970, ‘Chris Burden’ and ‘Comedy Sonatas’ in 1971, All-Night Sculptures’ in 1973 and ‘Vito Acconci’ in 1975. From 1972 to 1975 there would be free beer at MOCA as part of the sculpture ‘The Act of Drinking Beer with Friends is the Highest Form of Art’ by Tom Marioni and Allan Fish. The steadily growing rows of empty beer bottles lined up on shelves along the wall recorded the progress in time of this sculpture.